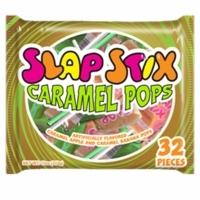 Slap stick caramel pops in a mini version for Halloween. These slap stick suckers make a perfect retro Halloween candy. Each bulk bag has 32 mini pops.